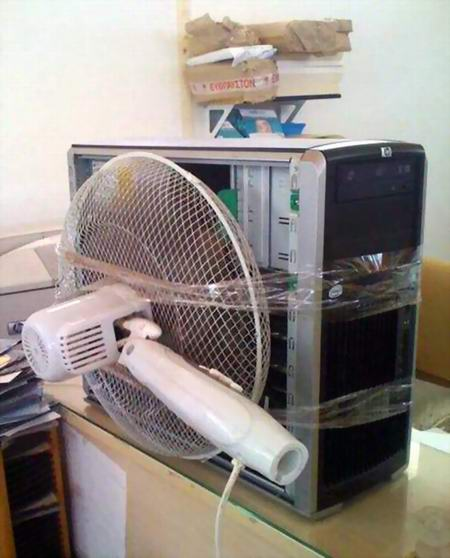 South Africa is a hot place to live, in summer we can have 30c days and in winter we are lucky to see single digits at all… This leads us to a small problem, how do we keep our tech cool? Fans …..mostly, moving air over a heat sink is still the most common way to cool a heat loaded chip. 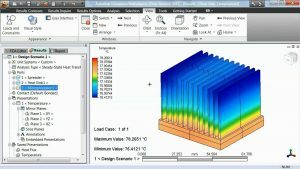 An extruded metal heat sink is usually used to dissipate more heat into a larger surface area and allow a more efficient method of transferring the air to the outside world. Many gamers will tell you about the heating effect experienced when playing for a few hours. A pc putting out 40 – 60c of heated air generally filling the room at around 50 cfm. Now I am only going to talk about dust and how it has become more of a problem than people realize. Imagine this, a CPU running at full steam is sitting with a heat load of 100w and running at 60c. 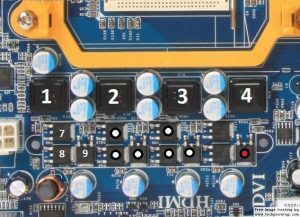 to power it the PWM or MOSFETs power delivery sections of many motherboards are also running hot not just because they are right next to the hot CPU but also because they are having to output that 100w of power and still the in-efficiency head room of the circuitry. As you can probably tell, this area is a very hot and bothered area. So what is dust? Dust is known as “ fine, dry powder consisting of tiny particles of earth or waste matter lying on the ground or on surfaces or carried in the air. “ essentially it is the bits and pieces that are lying around and also dead skin, don’t forget about the bits of old skin and lint that make up a large part of what we know as dust. Now, dust clogs up the system, quite literally, It starts to build up on the heat sinks fins (these areas are engineered to extend the surface areas for the air moving over them to pick up the heat and move it away.) and impedes the air flow. With time, these fins get clogged up totally, leading to the system primarily throttling and eventually leading to a thermal shutdown if run too hot. The thermal throttling is not a good thing, yes it saves your system and allows a more flexible and reliable system but it should only be used as a safeguard against out of bounds usage. Moreover, there are other parts of this system that are going to feel the heat. Particularly those power sections and the IOH or Chipset. Many motherboard manufacturers rely upon the airflow from the CPU and case to allow some cooling. 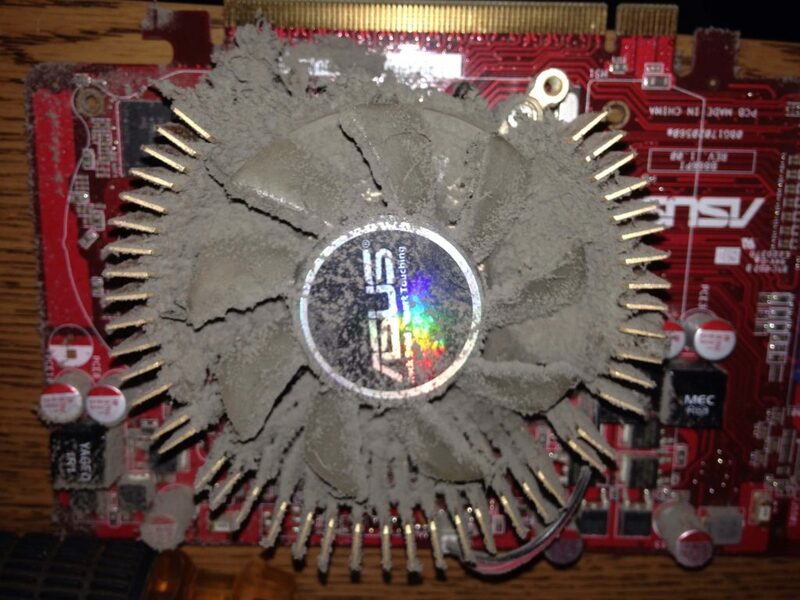 I have seen many computers come in with blown capacitors and thermal paste that is more cement that heat conduction compound. Many computers have arrived not working at all, after stripping it down and cleaning it properly, all was working again. 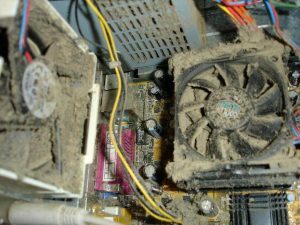 In some cases hardware failure comes from the fan it self being unable to rotate from the sheer amount of built up dust. This situation is not only bad for the components as it makes them overheat but also bad for the fan itself as it relies on the airflow it generates to keep cool as well. For my usual regiment, I like to take every computer that comes in and blow it out with the compressor. I have a plain old air compressor, it is a new 16 bar machine that is great for really dirty machines or if i bought a group buy again and have 20 machines to clean as quickly as I can. The other compressor is a much “smaller machine” not really a compressor but more of a very high speed blower. it works great for the fact that it just plugs in and works, no waiting around for pressure to build. It cannot really remove the long term dust as well as the compressed air at higher pressure and speeds. This machine is used for laptops and other smaller more delicate works or to just maintain something that is already clean but is going through maintenance. Cans of air are also an option for many that do not have the use of a compressor and just have their own machines to work on. A quick blast once or twice a month should be enough for the average user to do and stay maintained. 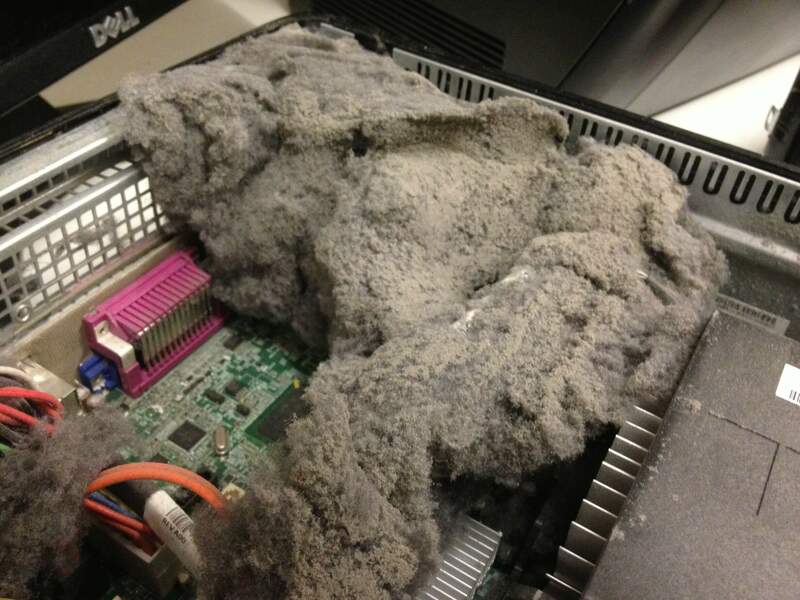 It is recommended that all computers get an annual spring clean. Bring your machine for a spring clean now and save yourselves the worry of the machine you relied upon not last you as long as you had hoped. If you mention the code SPRING before September 25th when booking your appointment I will give you a flat rate of R100 till for a basic service of your trusted equipment. To sweeten the deal a bit more, I will also waive the book in fee for a friend if you would like to bring them to me for any problematic equipment that they might have.